Home › Featured › Join our Happy Hour Fundraiser for Housing Rights! Join our Happy Hour Fundraiser for Housing Rights! 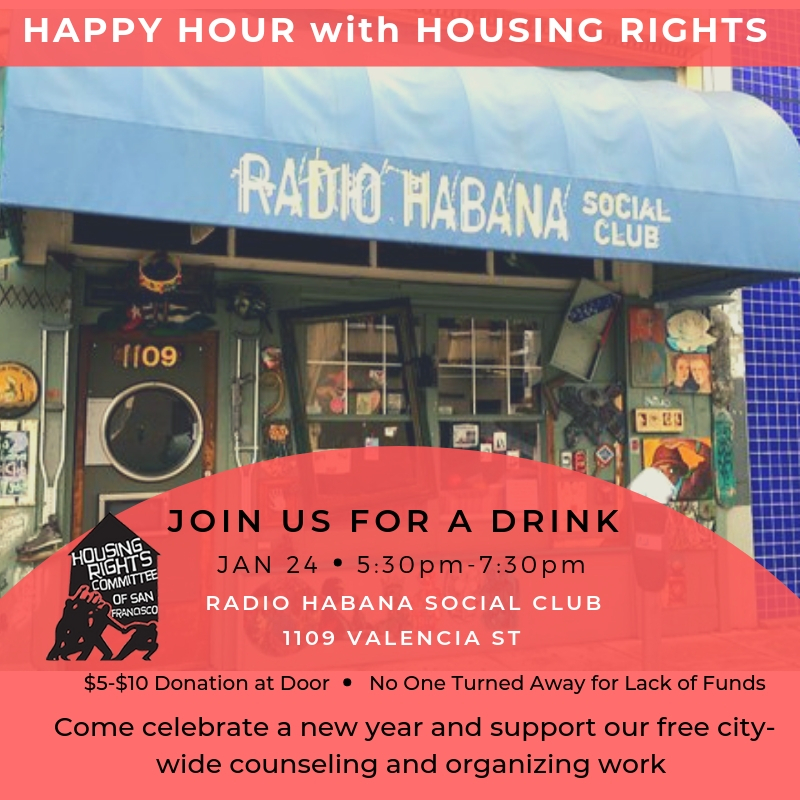 Join us for Happy Hour, Thursday Jan 24th 5:30-7:30pm at Radio Habana Social Club – 1109 Valencia St! Come celebrate a new year and a continued fight for housing justice with us! $5-$10 donations at the door (No One Turned Away for Lack of Funds). Proceeds will benefit our free city-wide counseling and organizing to keep tenants in their homes! ‹ Public Hearing about the Monster in the Mission! Sustain the fight for tenant’s rights! Donate now to help HRCSF continue to fight for tenant's rights and serve more SF residents. Become an HRCSF tenants rights counselor and help clients who call or come into our free tenants rights clinic either at our Mission or our Richmond offices. Students internships also available. Click here for more info. Or call us at 415-703-8634 and ask for Tommi or Stephanie or email us at tmecca@hrcsf.org, if you want to volunteer at the Mission office. To volunteer at the Richmond office, call 415-947-9085. Stay in the loop and keep informed about the many exciting campaigns, movements and meetings happening in the city. Memberships help support our work and keep our services free for all tenants in San Francisco. It doesn't cost much to join - Click here to be a part of our work. 9am-12pm – Mon, Wed, Thurs, Fri.